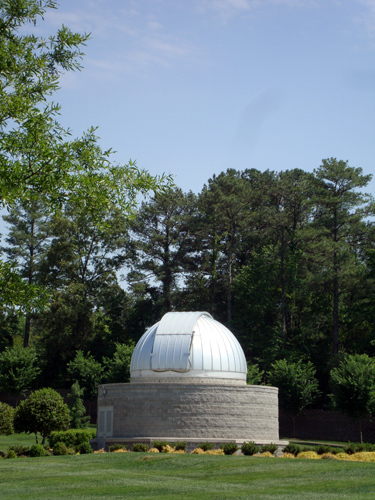 The Tellus Science Museum is a treasure just waiting to be discovered by the millions who live in and visit Atlanta. You’ll be pleasantly surprised at what you uncover, I believe. I like this museum so much because it has artifacts, exhibits, and humorous displays the likes of which I’ve never seen. And that it’s a Smithsonian Institution affiliate museum adds to its allure. 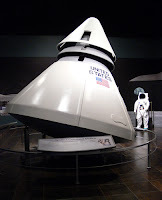 I’d heard about this really cool science museum (Tellus) way out in Cartersville, Georgia, and wanted to see it, but the distance deterred me...until now. On the day of my visit, I picked up a friend about 30 minutes later than originally planned (I had to stop by the office for a quick meeting) and then we were off. My GPS said the drive was a little more than an hour, but it took only about 40 minutes to get there. That’s a lot less time than many Atlanta citizens spend driving to work every day. We saw the grounds of the museum almost immediately after pulling off Interstate 75. There was no mistaking that we had reached our destination…the tell-tale signs being a geodesic dome, a huge satellite dish, an observatory, and an alternative fuel windmill. The building itself is also uber-cool. It departs the traditional square box to such a degree that you know without a doubt that you’re somewhere special. The components of the structure include black tiled units shaped like the “sandcrawler” transport that carried R2-D2 and C-3PO in one of the first scenes of Star Wars: A New Hope; sandy color more traditional stone units; a higher placed white plank structure; and taupe units covered in subway tiles. It looks like Frank Lloyd Wright meets The Jetsons. Travis next to the "Tonka Truck"
Well, before we even got to the parking lot, we could see the biggest Tonka Truck (actually, it's a Komatsu) either of us had ever seen and you know guys and big trucks…we made a beeline straight to it where photo-making immediately ensued. At 6’2” and 6’3”, neither of us even reached the top of the tire rim, let alone the top of the wheels…this thing is huge and so cool! 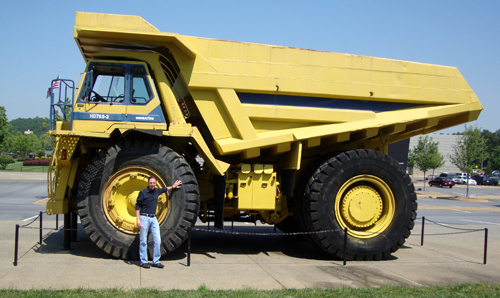 There are several other rather large vehicles on display with this one, but the “Tonka Truck” was just so much fun. Even more excited to get started, we headed into the museum. The ticketing staff was incredibly nice (as were all the staff throughout our visit). We were asked if we’d like to see a planetarium show, that there were five to choose from. Not that I even had to ask, I pointed to the “The Search for Life: Are We Alone?” option and without a word, my friend gestured an affirmative. “We’re both space people,” he said to the ticket agent. Maybe we should have clarified that we’re not actually from space, that we’re actually space enthusiasts, but I think they kind of figured that out…hopefully, anyway. We had about 25 minutes until our show so instead of going into the first gallery and feeling like we were rushed by having to make our show time, we opted to go to the café for a snack…it was approaching lunchtime, after all. Again, more very pleasant members of the Tellus staff helped us with our lunch selections. 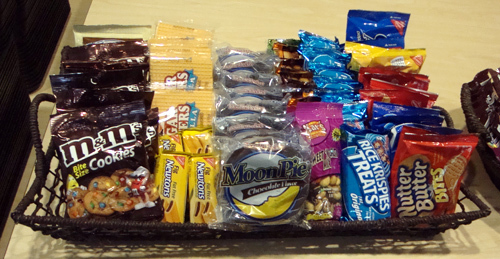 While standing in line I noticed a lot of the expected snack items and then there were the Moon Pies, a Southern delicacy from my childhood. I opted for a salad and a mango dessert, but it was fun to see the Moon Pies (they were foretelling of the humor we’d see as we explored the museum). As we lunched, we looked over the museum brochure reading blurbs about the four galleries, the planetarium, the Solar House, and the Fossil Dig and Gem Panning areas…there was so much to do! We got to the planetarium in plenty of time and were enthusiastically greeted. Don, the projectionist, joined us in the theatre (we were the only ones there) and chatted with us for a couple of minutes before time for the show to start. He kindly gave us a pre-show of the stars, as would be seen from Cartersville that evening, before starting our “Are We Alone” show. We’d been there less than an hour and were already made to feel like we were VIP members. The show was great and I learned something new (that we’re discovering approximately one new planet in our galaxy every month). I hope Don is working next time I visit…he was the perfect host. The entrance to the Weinman Mineral Gallery is marked by a seven-foot tall amethyst geode (that's actually white instead of purple). Its alluring call from across the great hall foretells the wonders to be found inside…and indeed they are wondrous. 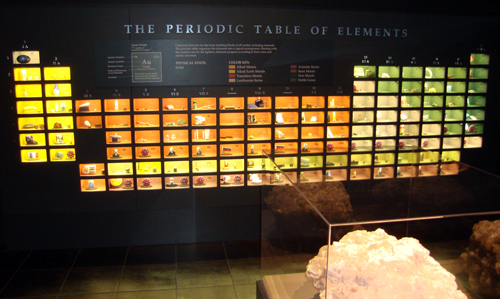 I first have to tell you about one of the funniest exhibits I’ve ever seen in my entire life…their Periodic Table of Elements. The “table” is a rather large exhibit reaching heights taller than me and comprised of illuminated boxes. Expecting to find rather dry scientific information within the individual boxes, I was quite pleasantly surprised when I looked in the container for Iridium (I was curious because of my knowledge of the satellite company called Iridium). The inscription, along with its Latin name, element number and symbol, reads “Iridium. Discovered 1803. 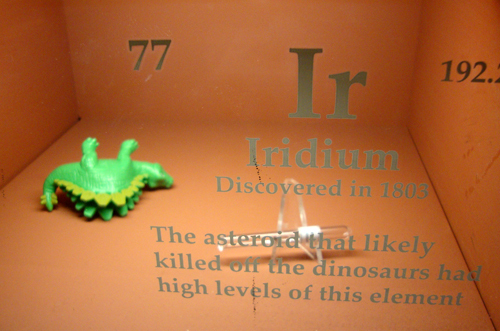 The asteroid that likely killed off the dinosaurs had high levels of this element.” Inside the case is a toppled over green toy Stegosaurus! The Weinman Mineral Gallery, named for William Weinman, a mining pioneer who spent a great deal of time in Georgia, is a geologist’s dream come true. There are more than 50 cases containing a wide variety of the most colorful Georgia minerals and gems, as well as a considerable amount of gold. 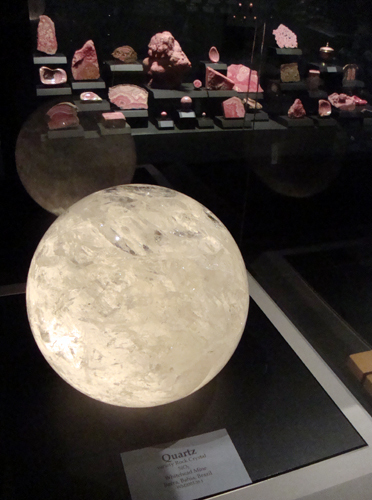 Two of the coolest cases, I thought, contain a collection of minerals, each specimen in spherical form. 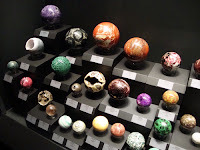 There are also two very large spheres nearby, one of crystal, glowing white, and the other is of the deepest, blackest Obsidian. 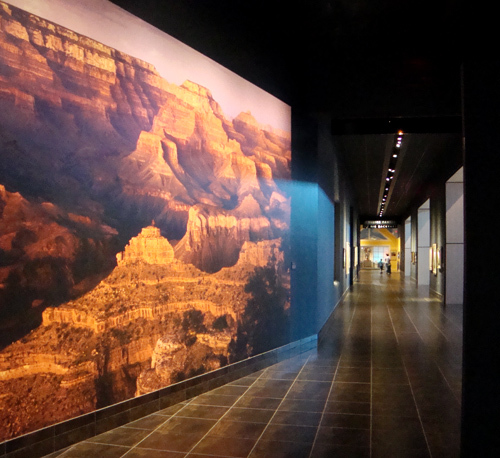 Getting back to the chronology of the gallery, when you first walk in, the first exhibit shares with visitors how the Earth was formed billions of years ago, with a massive display of the Earth’s layers, from its crust to its core. One of the best surprises in the gallery was the fluorescent mineral room. 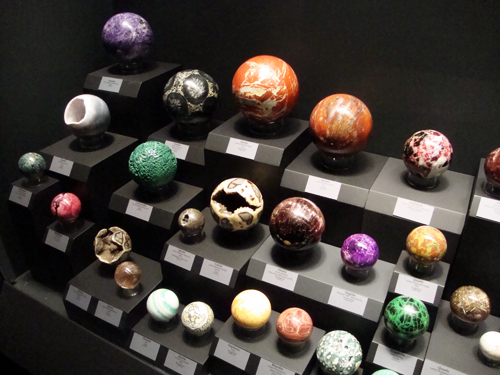 With the touch of a button, you get to see various minerals under different spectra of light, which makes the minerals glow in a range of colors you’d only expect to see on a paintball field. Another display features the twelve birthstone gems. I was born in January so my birthstone is garnet. In the display, garnet is shown in its natural form, its harvested form, as cut gems, and even set in a piece of jewelry. This gallery contains fossilized trees; huge amethyst geodes; a nine-foot, nearly 5,000 pound copper boulder; and so much more! 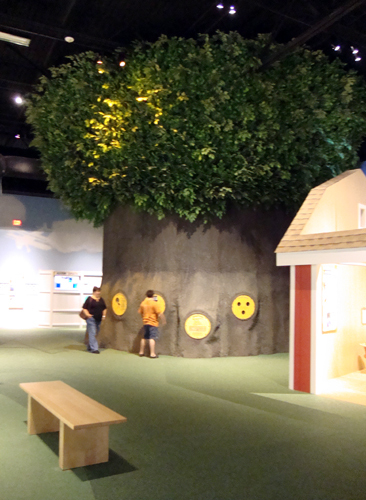 This exhibit has everything…including the kitchen sink! That’s right…there’s an exhibit that shows what minerals are used in food and automobiles, as well as home construction using a cutaway of a kitchen sink as an example. A Tyrannosaurus Rex is ultra-cool no matter where you see him (or her). But couple it with dozens of other dinosaurs and you’ve got yourself one incredible exhibit! 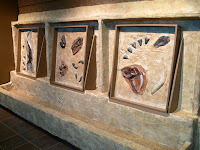 The best thing about the Tellus Fossil Gallery, for me, was the inclusion of numerous dinosaurs that I’ve never even heard of or have never seen outside of the pages of a book (some not even in any of the now countless Hollywood films featuring dinosaurs). 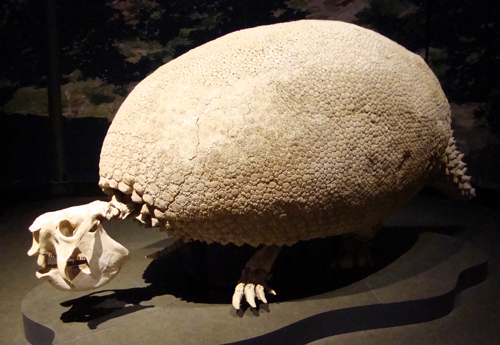 The one that I personally found most fascinating was the Glyptodon, or the “Giant Armadillo.” At nine feet long, you would think it invincible, but it’s believed that the saber tooth cat and humans may have led to its extinction only 11,500 years ago. Speaking of nine feet, there’s on display the jaw of a Megaladon (a shark), which was larger than a school bus (evidenced by a pictorial placard comparing the size of the two side by side). The Georgia Underwater exhibit is a must-see! It features some rather scary giant fish and one very cool reptile (a sea turtle or sorts) that are native to Georgia. 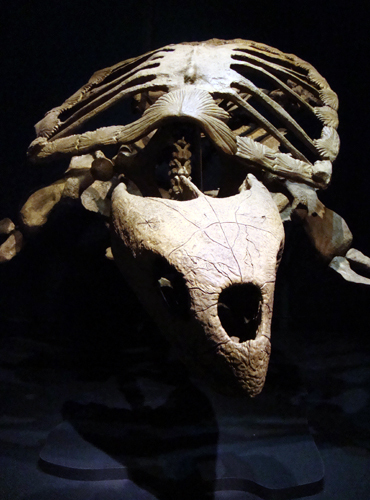 I found myself fascinated with the Protostega, a sea turtle measuring 11 feet long and 15 feet wide. The Loggerhead Sea Turtle at Georgia Aquarium would seem like its tiny baby in comparison. Others I really liked were the Triceratops; the 17-foot Xiphactinus; the Mammut; and a fossilized dinosaur egg from China, although it doesn’t note what kind of dinosaur would have hatched. 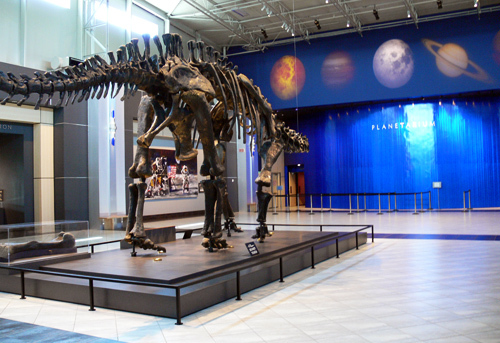 Not to compare, but—ok, that’s exactly what I’m doing—as much as I love the Fernbank Museum of Natural History, Tellus gives you more bones for your buck, more dinos for your dollar, and more of a collection for your coin. If you’re little one(s) is a dinosaur enthusiast, bring him or her to Tellus. Ok, so that heading isn’t exactly telling. It’s actually called the Science in Motion Gallery. And its displays are a plethora of its namesake, particularly via vehicles. And by vehicles, I mean buggies, bikes, cars, boats, helicopters, airplanes, rockets, and space ships! As much as I love space, when I was a sophomore in high school, I wanted nothing more than to be a helicopter pilot. Alas, that dream did not come true (not yet anyway), but my passion for the aircraft has remained steadfast. 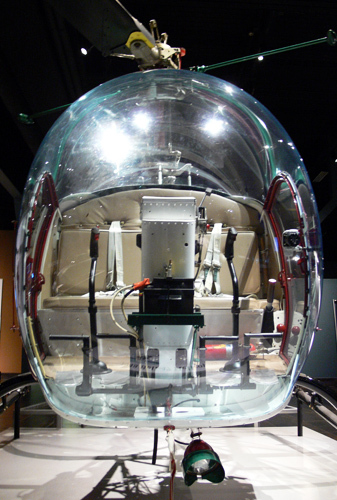 The 1948 Bell-17 Helicopter on display became the center of gravity for me while touring this gallery…I was drawn to it multiple times. I also enjoyed the rocket models (they have a small model of the 200-foot tall Proton rocket, which I’ve seen up close at the Baikonur Cosmodrome in Kazakhstan—very exciting! ); the space capsules; and the space suits (especially the American one that is also a photo opportunity—you can put your head in the helmet). There’s also a full-size replica of the 1903 Wright Flyer. This gallery covers more means of transportation than you would see in an Atlanta two-hour traffic jam! The Big Tree is inside the Collins Family My Big Backyard gallery and it is indeed a “big” tree…towering at least two stories. Not having a kid or kids with us, we spent only a little time in this gallery, but enough to see how much fun it would have been had we visited many (many, many, many) moons ago. There’s a barn, a green house, a big yard, a tool shed, and the Big Tree. Each of them has science discovery stations that include alternative fuel demonstrations, (safe) electricity experiments, and fully-contained biospheres. There’s more! In the back of the museum there’s a Fossil Dig room and a Vulcan Materials Company Gem Panning room, complete with a working water wheel. I saw the word “Vulcan” and of course had to check it out. We were greeted by Kathy, who, despite these particular attractions being geared toward children, made us feel welcome and right at home. She explained what the exhibits were all about and invited us to dig and pan. Unable to resist the urge, we did in fact dig (I found a Sand Shark tooth) and we panned for gems (I found some amethyst and quartz). Lots of fun! Well, the visit wasn’t complete without a tour of the grounds, beyond the initial excitement over the giant Tonka Truck, that is. 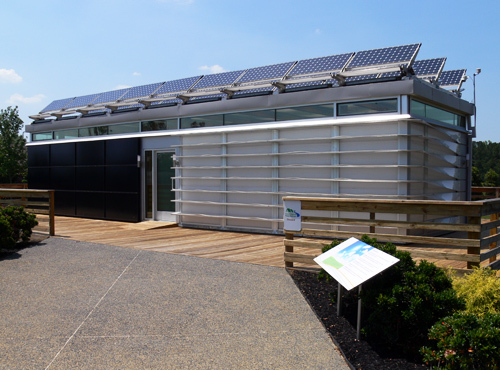 We went to the Solar House that was built by students at Georgia Tech and displayed on the National Mall in Washington, D.C. in 2007. I lived in D.C. at the time and vividly remember seeing the house then. A rather unique “small world” story, right? 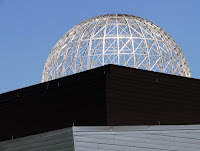 Tours of the Solar House are available Thursdays-Sundays, 1:00 p.m. to 4:00 p.m.
Also on the meticulously kept grounds are an observatory (I don’t think it’s operational though), solar and wind energy devices, and some large scale satellite dishes. Will I go back to Tellus? 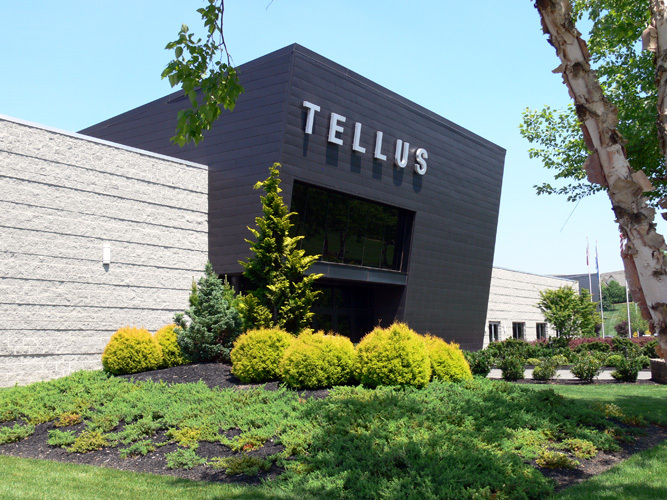 Let it be said far and wide that I will indeed return to Tellus, to explore the museum in greater detail, to attend one of their monthly lectures, or even one of their special events. There are also quite a few other museums in Cartersville, so I want to explore those, too. And while I’m in town, I’ll definitely stop by Coconut Ice Cream again in downtown Cartersville for another cone of coconut ice cream—delicious!